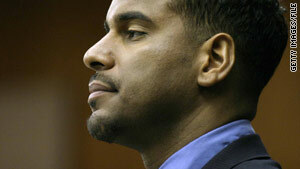 Jayson Williams, seen here in a New Jersey courtroom in 2004, retired from the New Jersey Nets in 1999. New York (CNN) -- Former professional basketball star Jayson Williams was arraigned Thursday on charges related to a crash earlier this week, when he allegedly drove a black Mercedes sport-utility vehicle into a tree, the Manhattan district attorney's office told CNN. Williams, wearing a neck brace, was arraigned via a video link from his bed at Bellevue Hospital, where he's recovering from minor injuries received in Tuesday's crash. He was charged with one count each of operating a vehicle while intoxicated and operating a vehicle while impaired, the district attorney's office said. A New York police spokesman said Williams hit a tree at high speeds after exiting FDR Drive near Stuyvesant Town at about 3:15 a.m. Tuesday. According to the criminal complaint, a witness saw Williams driving "in an unsteady and abrupt manner, in that the vehicle crossed four lanes of oncoming traffic and crashed into a tree." Witnesses told police they saw Williams, the only person in the vehicle, move from the driver's seat to the passenger's seat before police arrived at the scene. Williams' bail was set at $10,000. He was ordered by Judge Melissa Jackson to wear a monitoring bracelet. Williams, who retired from professional basketball because of injuries in 1999, played the last years of his career with the New Jersey Nets. He was known for his rebounding skills and averaged 8 points and 12 rebounds per game for the 30 games he played in the 1998-1999 season, according to the National Basketball Association's Web site. He is awaiting retrial on manslaughter charges related to the shooting death of his limousine driver in 2002 and has had other run-ins with the law since then. Calls to Williams' attorney were not immediately returned. CNN's Edmund DeMarche contributed to this report.